A piece of Indian jewellery that does not at all need an introduction is undeniably the traditional ‘Jhumkas’, also fondly known as ‘Jhumkis’. 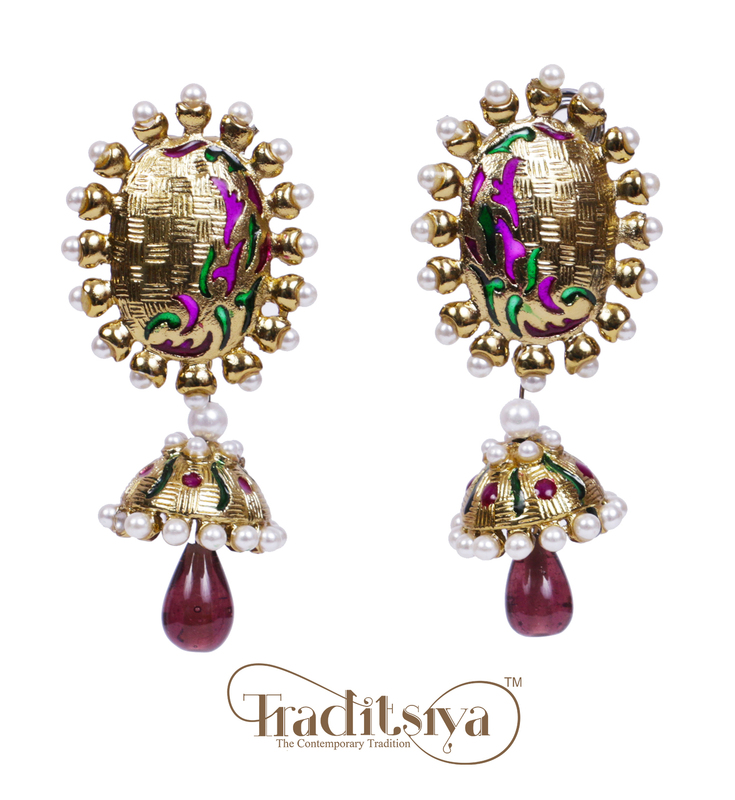 Old school yet highly in trend always, Jhumkas have been well preserved as a part of the exuberant jewellery culture in India since centuries. A favorite amongst the South Indians, women from different regions and states have not shied away from its allure. Having said that, this ornament has been modified and customised in an array of different styles to tailor the taste buds of women not just in India, but abroad too. 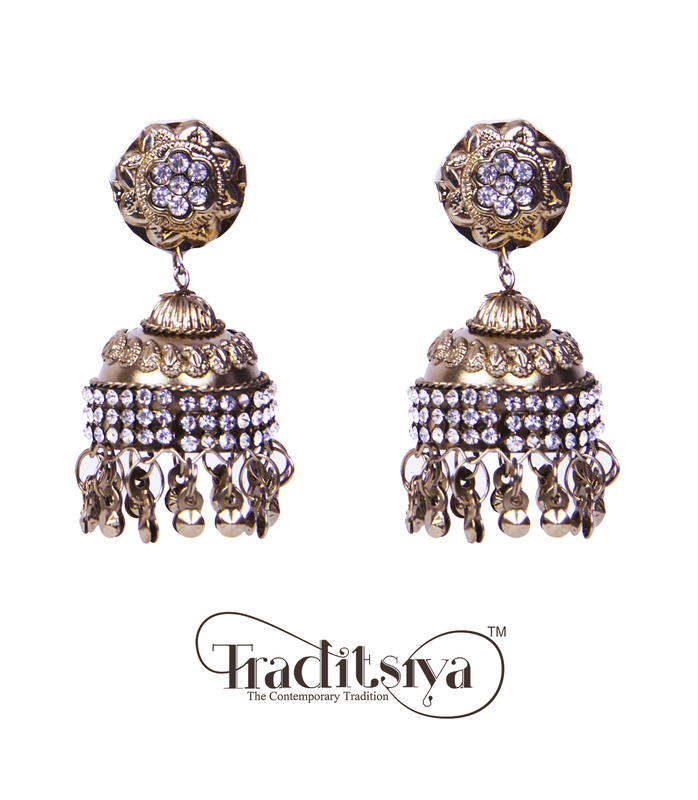 We, at Traditsiya, know the popularity of this charming earring type and hence, have always had Jhumkas as a part of our extensive jewellery collection. The conical bell-shaped chandelier earring is completed with a string of ‘ghungroo’ droplets, sometimes with or without a subtle drop inside the center of the dome. 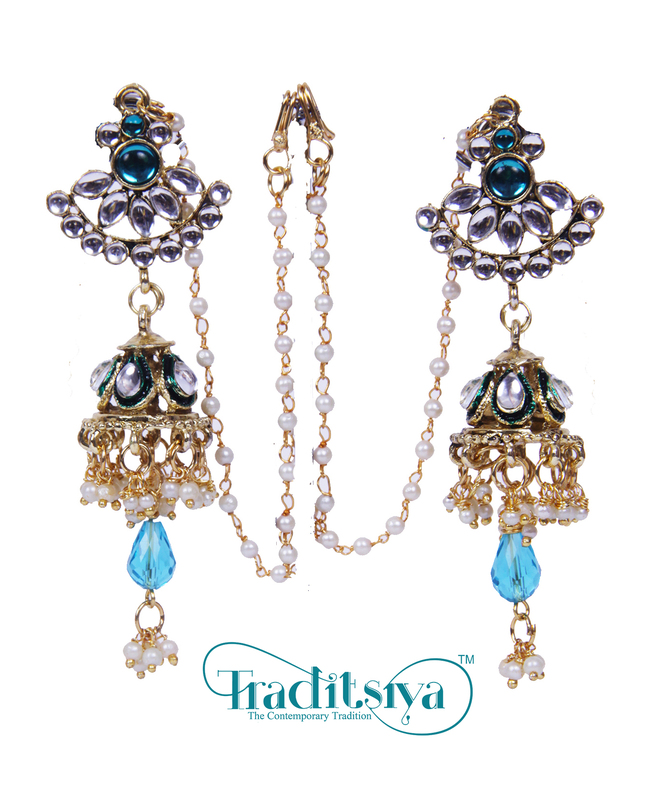 We display an assortment of this beautiful ear adornment distinct to every region and culture in India. 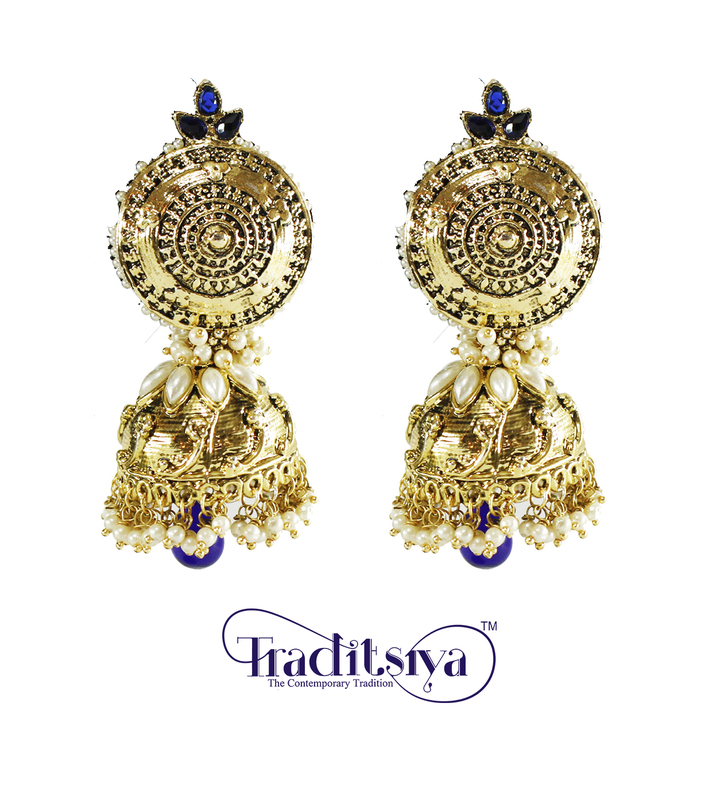 Jhumkas exhibiting antique designs especially in Gold can be traced back to traditions way back in history. 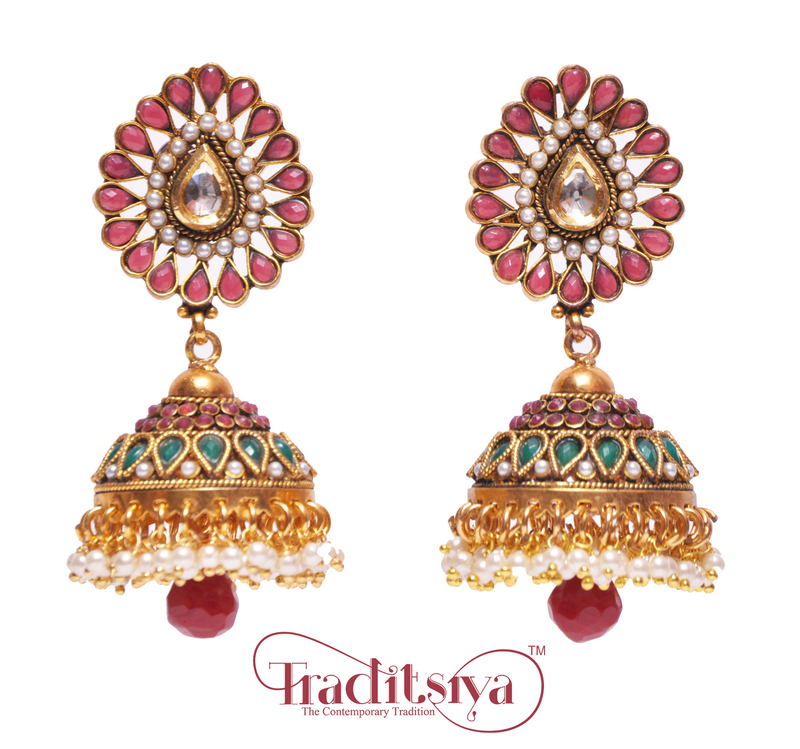 Traditsiya’s collection of these customary jhumkas is a class apart. 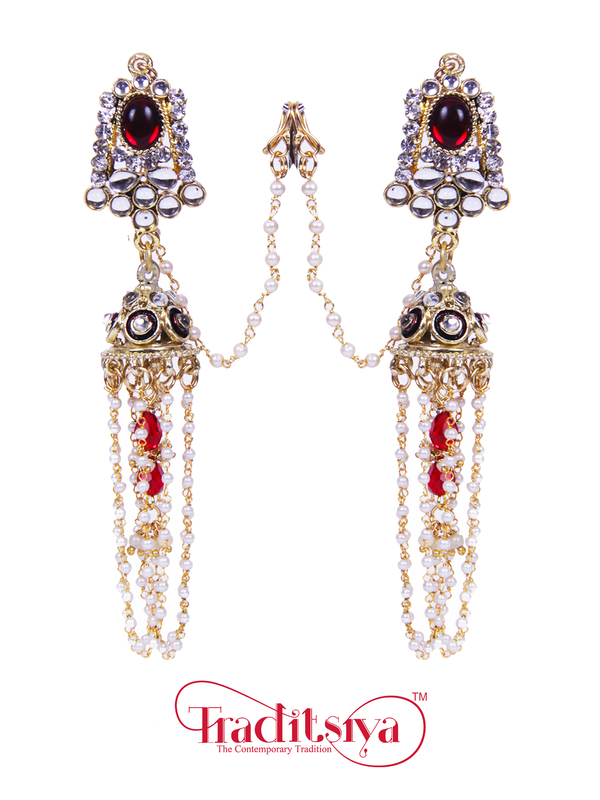 The pairs are festooned with coloured beads to add a dash vivacity. These are an exclusive to our collection. 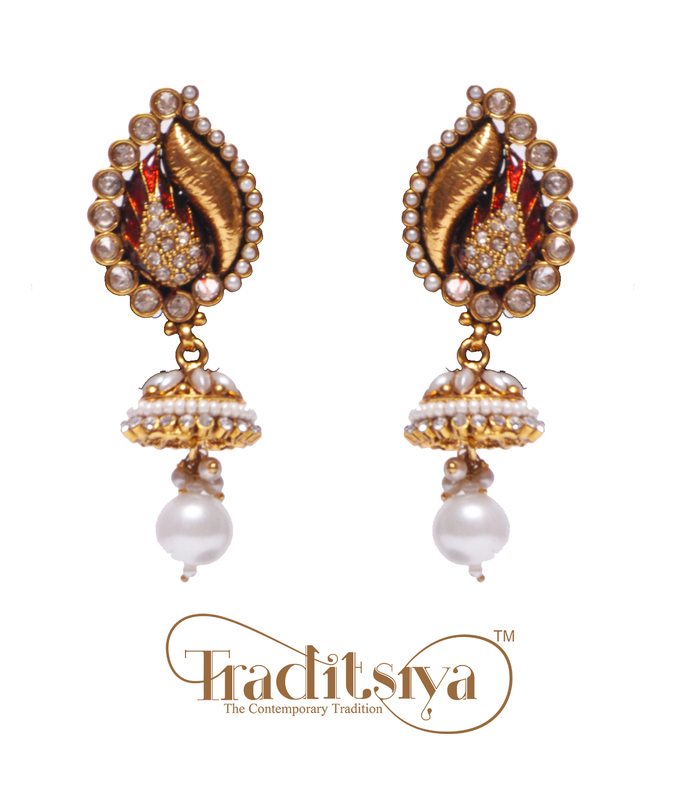 Kundan has always been our customer’s favourite, and so we designed these classic yet contemporary pair of Kundan Jhumkas with pearl chains attached. All of them have subtle hair chains attached with either the dome bell center with a drop of coloured bead or long strings of pearls hanging down gracefully. 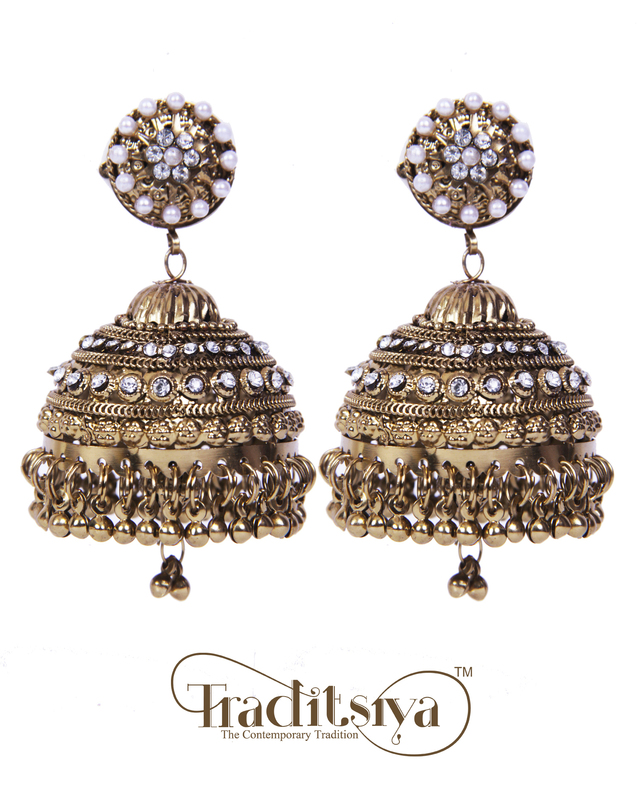 A specialty from Gujarat, the oxidised gold and silver jhumkas are highly popular during navratri. 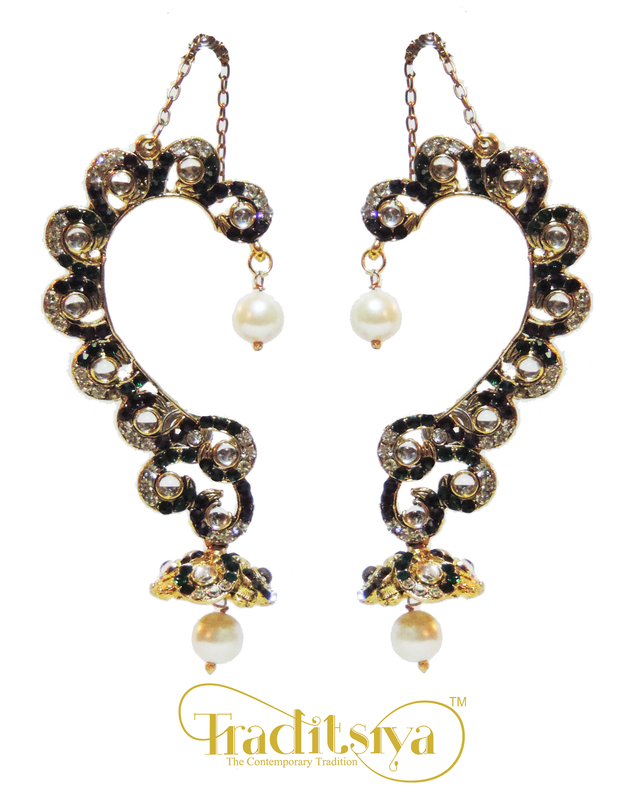 However, the charm of these earrings has gained admiration from all over the country and is high-in-trend now. 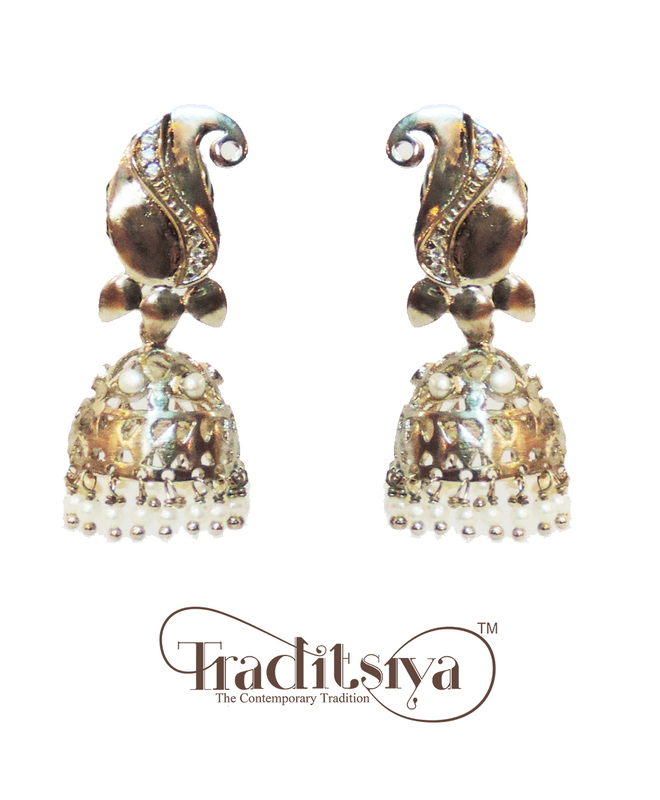 Traditisya’s Ear Cuff designs have not left behind jhumkas and it has been amalgamated exquisitely together. 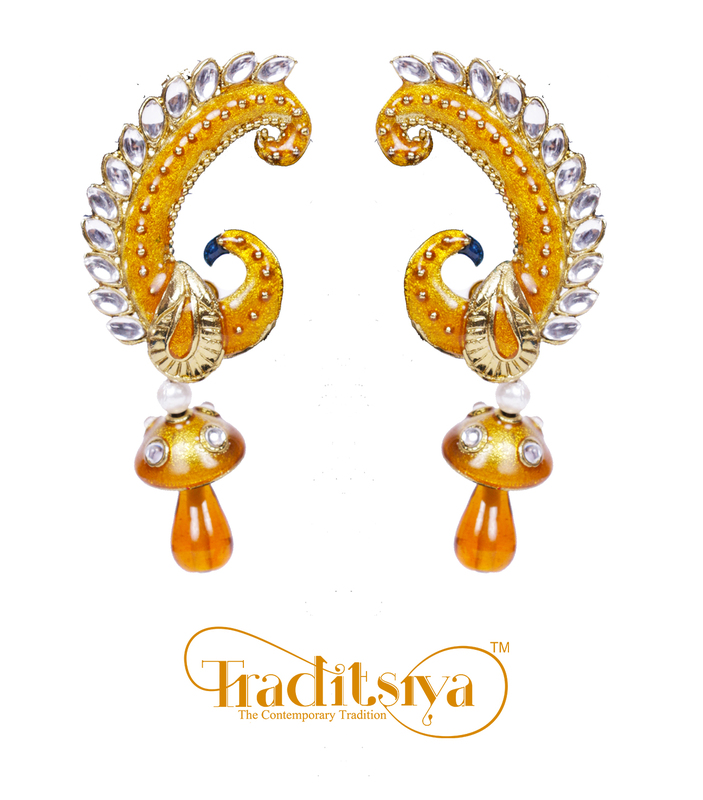 Check out the peacock style ones that go around the entire ear, fondly known as ‘Kaan earrings’. 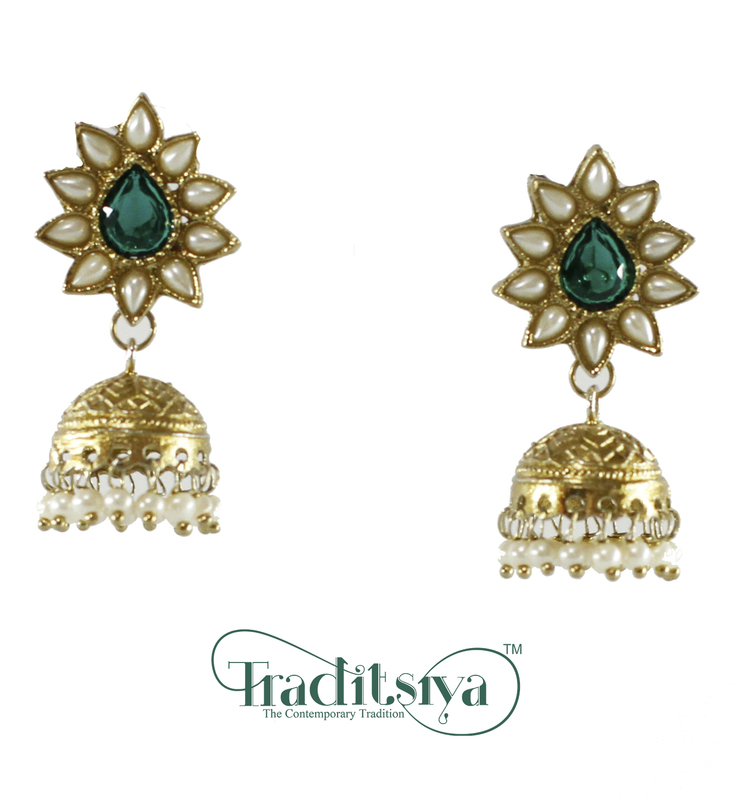 Dangle-drop Jhumkas are broadly branded into an array of types. 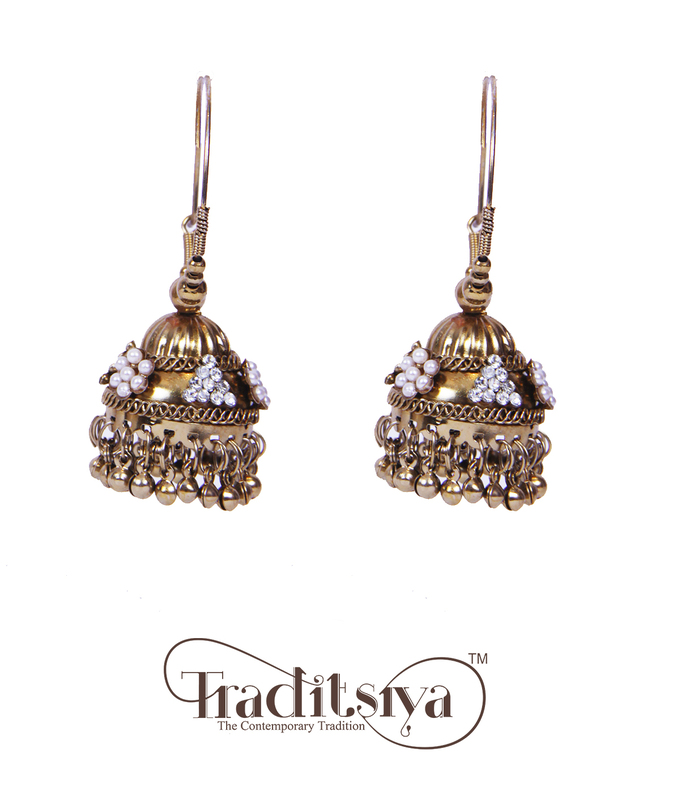 The designs range from crescent moon shaped hoop (chand balis) to Kashmiri styled jhumkas to conventional danglers attached with the jhumka bell domes. Guide To The Upcoming Festive & Wedding Trends!